I watch very little TV, but am a huge fan of Mad Men. For those of you from places where it does not yet air, it's a layered and sophisticated drama series about the advertising business, c.1962 in New York City. It's the best thing on TV since The Wire, (RIP) which has pretty much spoiled me for most everything else. The new season of Mad Men starts this Sunday night, and rest assured that I will be camped on the couch with an appropriate beverage at 10:00. But in my fanboy impatience for season three, I came across a pretty cool 'making of' video for this year's promotional poster. The concept is brilliant. Don Draper, the duplicitous creative director for Sterling Cooper and the lead in the show, is always juggling several dark secrets in the air at any one time. 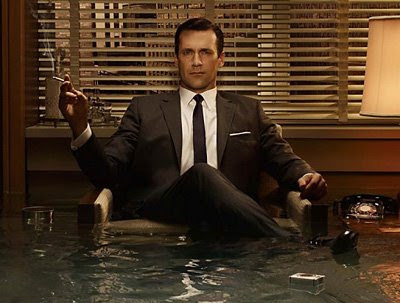 The idea to show him sitting amidst rising water his own office (without losing his perfect veneer of control) was spot on. I am a fan of the show's lighting just as much as of the show in general. It is sculpted -- very 1960s -- but with a modern twist. And the movie poster is no exception. Photographer Frank Ockenfels lit most of the frame from the back/right and top, with the back/right light motivated by the lamp visible in the frame. The frontal fill (if it is there at all) is several stops down, keeping things dark and moody. And they finish it off with a super-tight grid, almost on-axis (just above the camera) right on actor Jon Hamm's face. In essence, he is lit completely differently than is the rest of the frame. It's almost film noir everywhere but on his face, which gets the full glamor treatment. Which, of course, draws you right into his face while maintaining the mood in the rest of the photo. If any of you LA types has an in with the Mad Men folks and can get us an interview with whoever is designing the light (would that be cinematographer Phil Abraham?) hit me with some contact info in a 'do not publish' comment. If you are not in the US, you can see a list of international networks which air the show here. And click on the pic up top for a bigger, full version in another window.